Become your own blender to compete locally against anyone! The SuperBlend center enables the user to make a wide range of detergents and protectant products at the push of a button. Our patented design provides consistent quality, reliable operation, push of a button ease and proven Blendco performance. 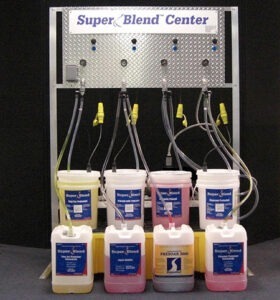 SuperBlend can make virtually any concentrated detergent or protectant at catalog prices. This means VALUE by means of a superconcentrate which reduces freight, storage and handling costs.